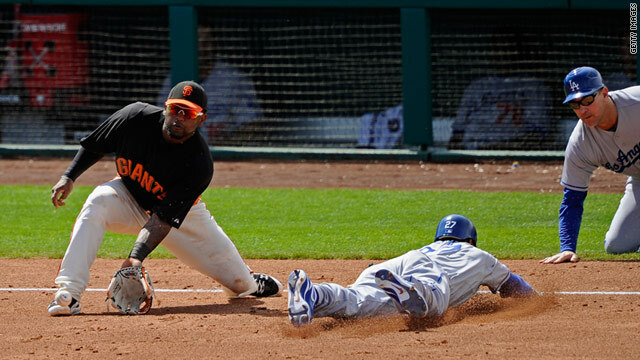 L.A. Dodger Matt Kemp dives in safely at thrid base for a triple during a March 18 game in Arizona. Los Angeles (CNN) -- Major League Baseball season begins Thursday and Opening Day will be full of sights, sounds, smells ... and stains. Fans love to watch the cat-and-mouse game between the pitcher and hitter or the wonderful defense dance of a 6-4-3 double play. Still others watch the players get dirty with ground-in dirt and grass stains and wonder, "How do they get those uniforms looking so brand new for the next day?" To answer this tough question, I went to the people who would know best: "clubbies." A clubbie is the nickname for the guys who work in the clubhouses. They're in charge of things like making sure the players' gear is ready to use and that the uniforms look good for the next game. "The process used to be just spraying some kind of a detergent right directly onto the fabric itself and scrubbing the heck out of it and causing it to look like some kind of a fur or something," said Mitch Poole, clubhouse manager for the Los Angeles Dodgers. "It was very labor intensive, too." I asked Poole whose uniform they dreaded most? Who is the dirtiest guy on the team? "We don't like to talk about it, but his initials are James Loney," laughed Poole. "He's hard to figure out." "We have to put that tape that police put around dead bodies around his laundry," he joked. I searched out first baseman Loney and found him on the way to the batting cage for a little pregame batting practice. I felt a little bit like a stoolie when I told him what Poole said about him: that he's the dirtiest guy on the team. "Probably," Loney said proudly. "I gotta get dirty, you know, playing defense over there, getting on the bases. There are guys who give false hustle and they got false dirt," he said. He explained that false hustle and false dirt happen when a player who is stretching gets a little dirt on his uniform and then acts like he got that stain from a hustle play. "But I'm legit," Loney said. Clubhouse Manager Mitch Poole says uniforms used to be scrubbed until the fabric resembled fur. So how do you get a uniform like James Loney's clean? First, it's a matter of understanding baseball-specific stains. They are called nature stains: grass, ground-in dirt, blood and sweat. Grass stains are probably the toughest. Grass contains a green dye called chlorophyll. So, in fact, the stain from grass is actually a chlorophyll stain. If you combine that with ground-in dirt or red clay, which is used a lot in infields, you have one nasty stain. The detergents and soaps that break up the surface tension of the water are called surfactants. They allow the detergent to quickly penetrate the cloth. Then the agitation of the machine helps to emulsify, or surround, the dirt so it won't go back into the clothes. Much of this depends on the electrical charges in the water and the detergent. But if the stains don't come completely out, you have to resort to using Poole's ancient pretreat, brush and flush method. "We did it that way for, shoot, 24 years at least," Poole said. Then, during a road trip to Phoenix about four years ago, Poole was talking with the clubhouse manager from the Arizona Diamondbacks and discovered the team used a new product, "Slide Out." It's an industrial stain remover specifically made for Major League Baseball by Perry Best and his partner, chemist Mark Simmons. 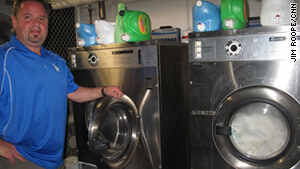 The two men were in the cleaning business and heard how clubs used all different types of pretreatments and other products to get the uniforms clean. So they formed their own company, Brody Chemical, and set out to develop a better cleaning product. Poole said what they came up with, Slide Out, is to him a miracle product. "It's a two-part process" Poole said. "Slide Out one -- a real dark purplish-brown liquid that goes on and it permeates into your fabric. And when you do it you think you're crazy because there is no way this is going to come out because I just made a big mess," he said. "Then there's Slide Out No. 2, which is a clear liquid that when it goes right onto the fabric and the chemical it turns it pretty much white. It takes everything out. It takes all the dirt, all the soil, all the metals that are in there and just pulls it right out." Best would not say what the secret ingredient might be, if there is one, but he did say the product would be available for consumers soon. So, mom and dad can look forward to having their kids' uniforms looking major-league clean every game.